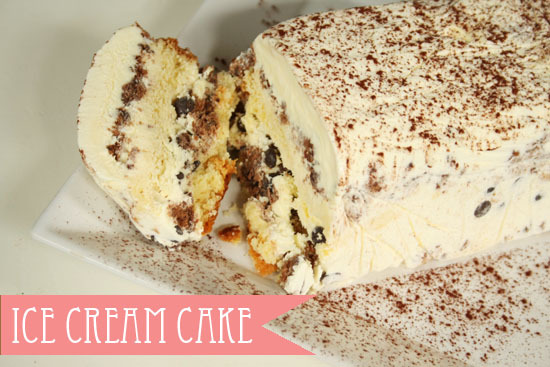 This ice cream cake is delicious and really easy to make. This should be a hit on your next dinner party or BBQ! It has a combination of vanilla an chocolate flavors, just delicious. Learn how to make this ice cream cake after the jump. . . Put a few layers of plastic foil inside a loaf pan. I used four layers to make it easy to pull the cake out of the pan later on. Let the ends hang over the edge. 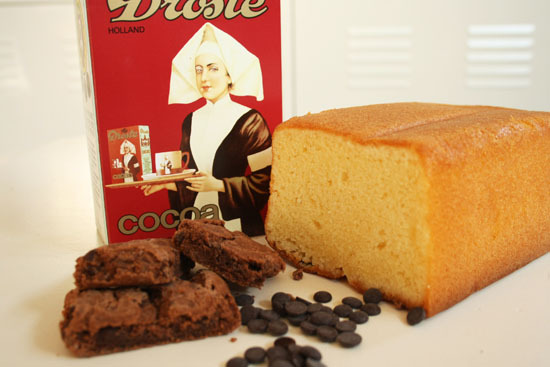 Crush the brownie cookies and slice the cake in slices from approximately 1 cm thick. Start with a layer of vanilla ice cream, then a layer of crushed brownie cookies. The brownie cookies make it easy to push the ice cream in the right shape, because they are not sticky like the ice cream. Put another layer of ice cream on top of that. Then a layer of cake with chocolate chips on top, another layer of ice cream, crushed brownie cookies mixed trough the ice cream and finish with some chocolate chips and another layer of cake. Put in the freezer for a few hours. When the ice cream cake comes out of the freezer you can pull the cake out of the pan by pulling the plastic foil. Remove the foil and finish with some cacao on top of the ice cream cake.